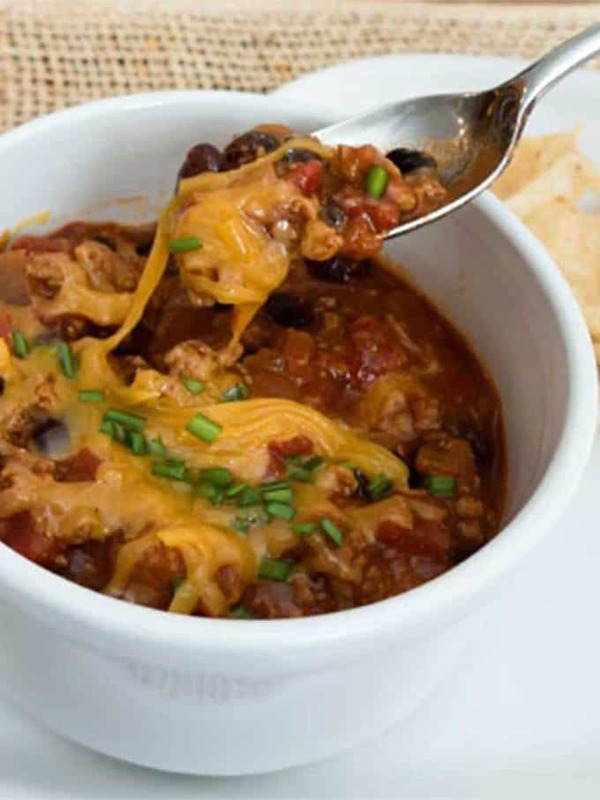 Turkey Chili is a perfect dish to serve for Cinco de Mayo. It’s easy to make, and spicy to taste. Top it with cheddar cheese, or mound it on lettuce for an awesome taco salad. What’s even better is that it makes incredible leftovers! 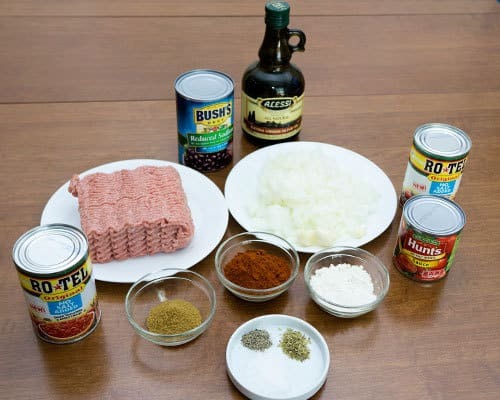 I used the following ingredients: Ground turkey, onion, garlic, flour, chili powder, cumin, salt, pepper, oregano, Rotel diced tomatoes and green chilies, tomato sauce, black beans and a little olive oil for sautéing the onions and garlic. First, I browned the ground turkey in a large Dutch oven, making sure to break the meat up into small pieces. Then, I dumped it onto a colander, and ran it under hot water. 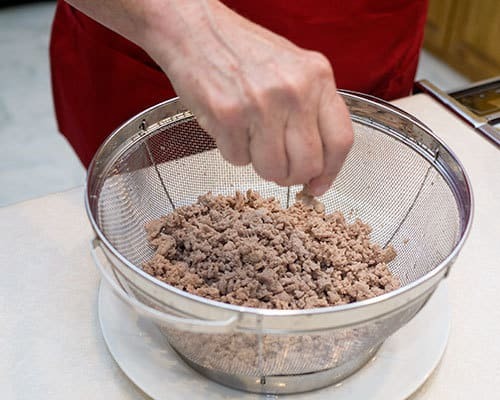 Even though the ground turkey is quite lean (I used 93% lean), I routinely do this until the liquid runs clean. After it had cooled a bit, I broke any large clumps into small pieces with my fingers. Next, I added a bit of olive oil to the same Dutch oven that was used for the turkey, Then, I added the onions sautéd them over medium heat for about five minutes or until they were tender but not browned. Then I add the minced garlic and continue sautéing until the garlic was fragrant. This took about 30 seconds. I returned the browned turkey to the Dutch oven, and stirred to combine. 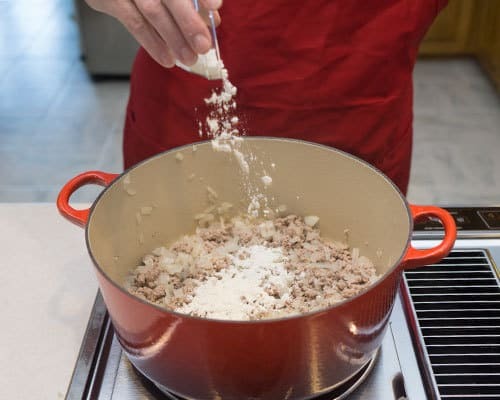 Then I add the flour to the meat mixture and stirred to combine. The reason for the flour is that it helps to thicken the mixture. Next, I added the chili powder, cumin, salt, freshly ground pepper and oregano. Both the Rotel tomatoes and the tomato sauce had no salt added. 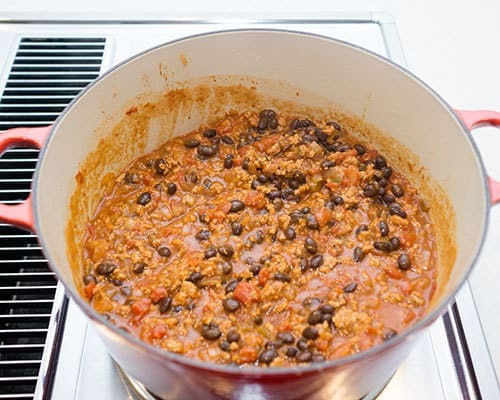 In addition, the black beans were reduced sodium. Therefore, I adjusted the taste by adding a bit more salt than my original recipe called for. After everything was well combined, I added the Rotel tomatoes and the tomato sauce. 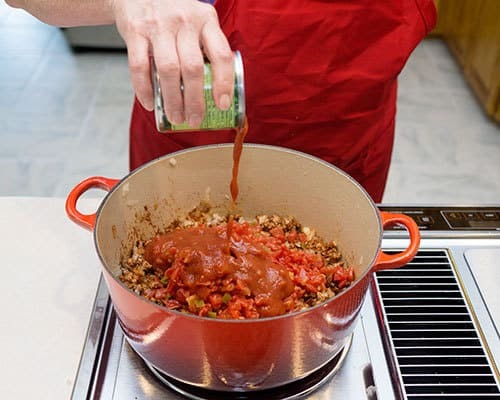 In the past, I had only used one can of tomato sauce, but both Susan and I thought that the mixture looked a bit dry. Therefore, I added a second can. I stirred the mixture, heated it to a boil, and then covered the pan. I lowered the heat to medium low and cooked the chili covered for about an hour. Meanwhile, I poured the black beans into a strainer, and rinsed them well. After an hour, I added the black beans to the meat mixture and gave it a good stir. I covered the pan, and cooked the chili for an additional 30 minutes. 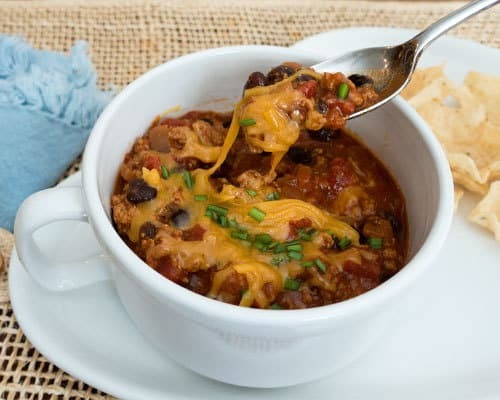 I corrected the seasonings, and voila – an incredible turkey chili! For dinner, I served the chili topped with some shredded cheddar cheese, and garnished it with chopped chives. On the side, I served a green salad, some tortilla chips and a chilled Chardonnay. What we didn’t eat went into the freezer for another delicious meal.Yum! 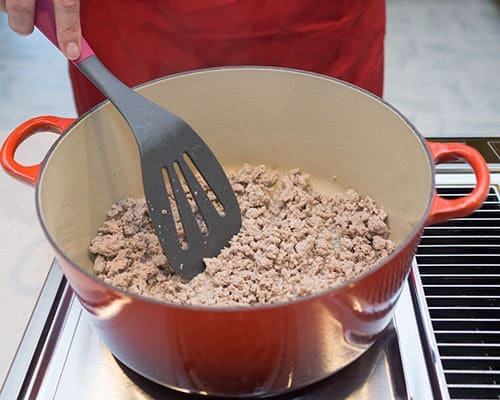 Cook and crumble ground turkey in a large Dutch oven over medium heat until browned. 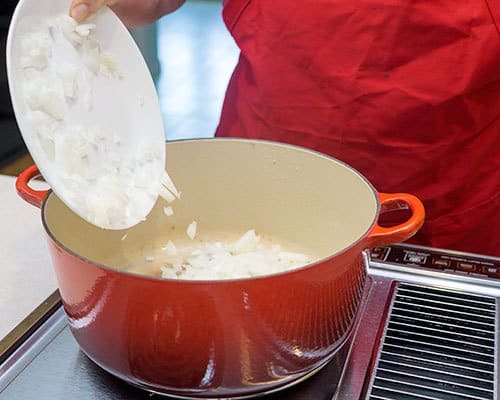 Pour into colander and rinse with hot water until water runs clean. Take handfuls and rub between hands to crumble into fine pieces. Rinse again. Heat olive oil in the same Dutch oven over medium heat. 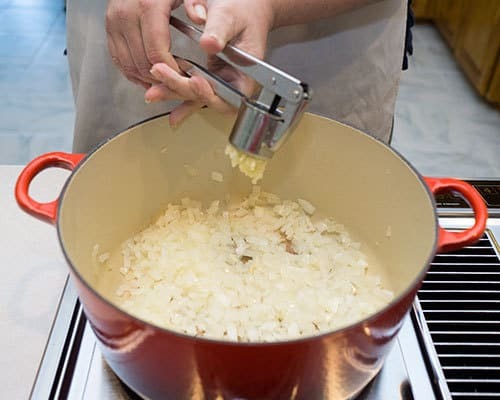 Add onions; sauté until tender, about 5 minutes. 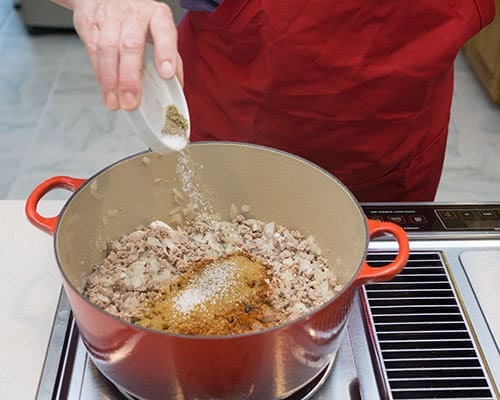 Add minced garlic; sauté until fragrant, about 30 seconds. Add browned turkey, flour, chili powder, cumin oregano, freshly ground pepper and salt. Stir to mix well. 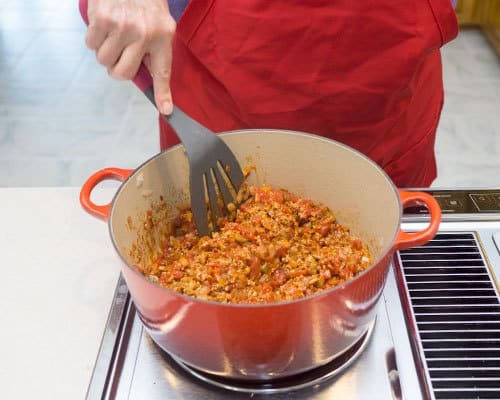 Add Rotel tomatoes and green chilies, and tomato sauce; mix well. Cover and simmer over low heat for 1 hour. 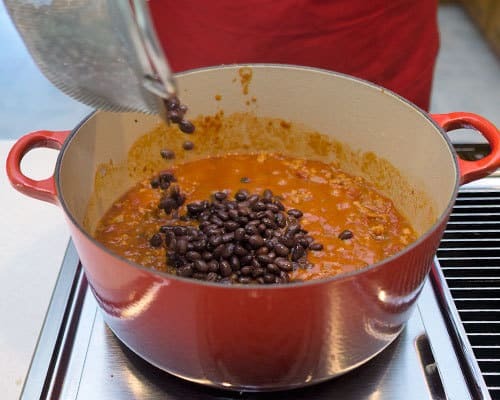 Add black beans; cover and simmer an additional 30 minutes. *May also use ground beef in place of the turkey. Variation: Serve warm chili on a bed of shredded lettuce and chopped tomatoes to make a taco salad. Garnish with chopped onions, crushed tortilla chips and shredded cheddar cheese.